The Rainbow Light multivitamins are formulated and distributed by Rainbow Light Nutritional Systems, but the product itself is made by a contract manufacturer in Columbia (South America). Below is our summary of the strong and weak points of this product, based on analysis conducted by the MultivitaminGuide.org team. One tablet a day: Suitable for people who do not wish to take multiple tablets a day. Attractive packaging: The unique design of the supplement bottle makes it strand apart from other products in the store. Affordable: The product is one of the cheapest multivitamins on the market. Misleading marketing: The label claims that the product is "natural" and "food-based", but in fact most of the vitamins it contains are synthetic. The Vegetable Juice Complex included represents a very small fraction of the volume of each tablet. Not organic: Despite claims on their website, organic ingredients in the Rainbow Light multivitamin represent a negligible part of the full contents. Made in Columbia: The product is not made according to the rigorous US quality standards. With an Effectiveness Score of 6.4 on a 10 point scale, the Rainbow Light multivitamin ranks number 29 out of the 100 multivitamins we've evaluated. Despite its claims of being "natural" and "food-based" this product is not much better than synthetic products like Centrum and One A Day. Even though this multivitamin is affordable, we believe it does not provide good value for money. If you are looking for a high quality multivitamin at a reasonable price, see our ranking for the top multivitamins below. 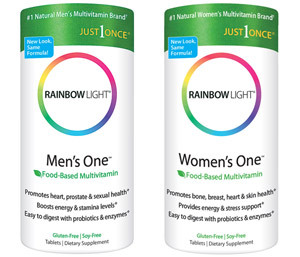 How does Rainbow Light compare with other multivitamin brands? MultivitaminGuide.org offers comparison between the Rainbow Light multivitamins and of all major vitamin supplements available on the market. Some of the unique aspects of this guide include comparison of the Rainbow Light Multivitamin with 100 other vitamin supplement products, including popular brands such as One-A-Day, GNC, Equate, Kirkland, Shaklee, Nature Made, NOW Foods, Melaleuca, Puritan’s Pride, Herbalife, TwinLab, and Walgreens. The table below provides a summary of the Effectiveness Scores of some of the more popular vitamin supplement brands available on the market, including the Rainbow Light multivitamins.